Trial and Erika: A mid-year resolution! Although it's pretty much the end of March I just got around to making a resolution for this year. With the exception of jeans, I will try my very hardest not to buy any clothes this year. The amount of money I wasted in the clearance section of Target last year alone could have paid down a healthy chunk of my student loans. I can literally count on one finger the number of Target items I wear on a regular basis, so it was all a complete waste of money. Next time I try to buy clothes at Target, somebody please just fill a wheelbarrow full of cash and then light it on fire in front of my face. 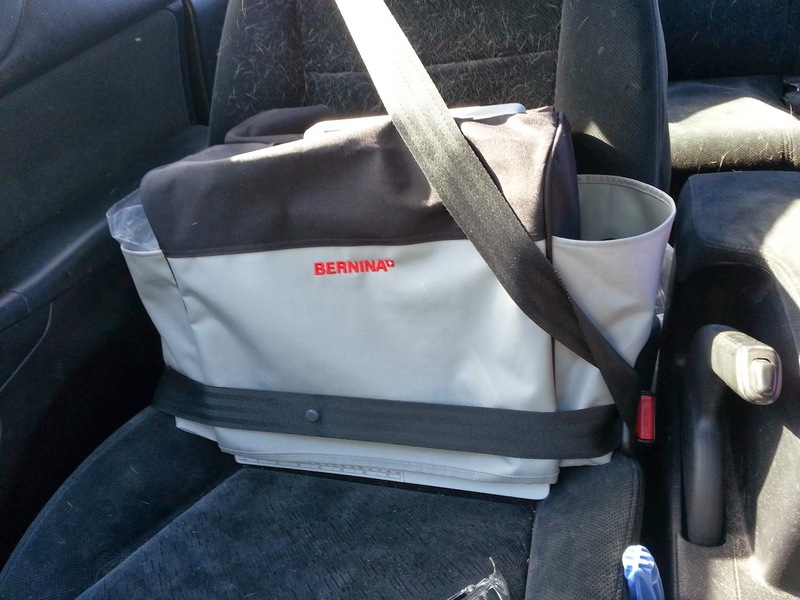 My Bernina 350PE, safely strapped in for her journey from the store to my sewing table. Incidentally, she's famous. My local Bernina dealer is amazing. It's actually really refreshing to stumble upon a sewing machine shop that 1. has a website and 2. updates it regularly. For every machine carried in the shop, they go through the instruction manuals and make video tutorials for each page/technique. I bought the floor model, and I'm pretty positive she was used to make the B 350 tutorials! If you have a Bernina or a Viking and you have no idea what the heck is going on with one of the accessories or techniques, check out this page! It's so nice to actually be able to watch someone do what the instruction manual is trying to explain. Ok so the Bernina was my impetus for this pledge. Also, my poor Singer Simple was on its last leg and needed to retire or be serviced. I wasn't really keen on spending $60-$80 servicing a $100 machine that I quite frankly hated, so I decided to upgrade. By a lot. Having a reliable machine has really boosted my confidence and really made me think it's possible to complete this challenge while preserving my sanity. Jeans are the exception because I inherited thunder thighs, and all my jeans suffer death by chub rub. Onwards and upwards. It's my birthday on Saturday and I have every intention of making a buttonless shirt dress even though I messed up and forgot to add seam allowance to the center front like a freaking idiot. Nothing like waiting until the last minute! Congrats on your new Bernina!! I'm a proud Bernina owner (and fangirl) and know you're going to love yours as well. Thank you! I'm so happy with it, it was definitely worth every penny. I'm following you too now! I love your springtime Archer. It's so spring-y!